The past two weeks have been busy mainly because of our family boot camp. The schedule is working well and so far getting up in the morning at dark and going to bed when it is still daylight outside has not hurt us. Today we are off from boot camp. My daughter is a bit under the weather. She is well enough to clean her room and later, she might join me for a cooking lesson. Earlier this morning I thought about our front yard. Since decapitating all of our shrubbery in front of the house, our house looks deserted and unwelcoming. Mom gave me two rocking chairs yesterday for my front porch, so while rocking in one of the rockers sipping coffee this morning on the porch, I contemplated what to do. I know that I need to remove all of our current bushes and start over. Our house needs a sidewalk and stairs to the front door. I would like to fix our house’s road-front appearance within the next five years. I better start saving for that now. I planted bush beans this morning. Normally I plant pole beans because I like how they keep on producing, but I did not want to build supports this year. This morning, in three small areas in the garden, I dug a foot wide trench and filled the trench with water. After 30 minutes more or less, I planted the beans in the muddy bottom of the trench, then covered the seeds with dry dirt. That was easy enough, however; in one plot, I added no compost, in another plot, I added compost to the top of the dry dirt, and in the third plot, I sprinkled the compost over the muddy bottom of the trench and planted the seeds on level with the compost. We will see how the beans do and if there are any differences. For the fun of it, I planted a few asparagus beans under sturdy sunflower plants. Asparagus beans make long thin green bean fruits (I suppose they are fruits.) I’ve grown them before, but it has been a long time. My seeds are old and I hope they sprout. 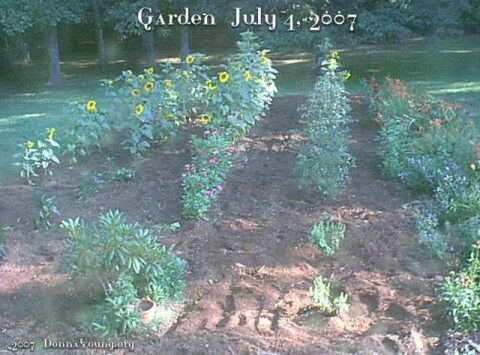 This is how my garden looked on the morning of July 4. It has grown quite a bit since we have had rain. I continue to water the plants because the soil had become very dry this past spring and some of the plants wilt if there has been no rain within a few days. I finally managed a photograph of a zinnia that is in focus. 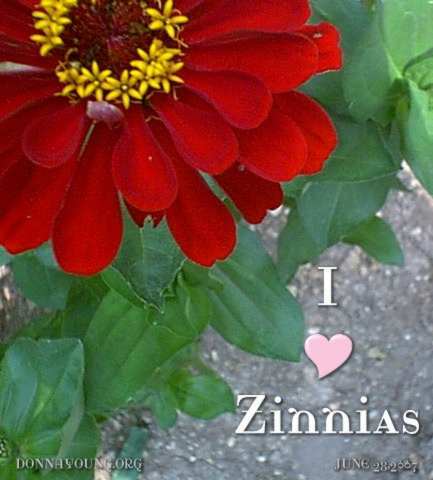 The circle of little yellow flowers in the zinnia bloom can be seen in this image. Recently a hummingbird visited the zinnias and that is just another bonus of growing them. Yesterday a goldfinch was sitting on one of the older zinnia flowers. Goldfinches like zinnia seeds. 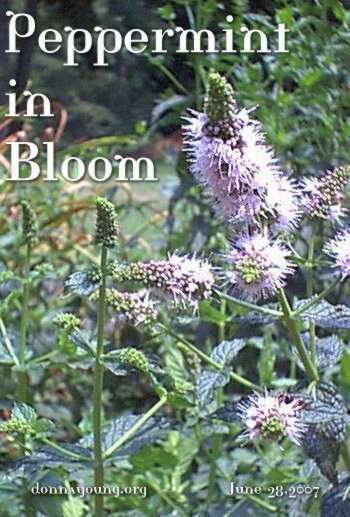 This is how peppermint looks in bloom. It is pretty and it attracts various bees. I have not taken the time to identify the bees, but I have heard them described as ‘beneficial’. Some day I hope to write about mint. I harvest and dry the leaves for mint tea. Quilt Update:- Last Thursday, I removed the red spiral center and adjacent dark blue corners from the quilt. I sewed a new middle for the quilt. While the red spiral was pretty, it did not really go with the quilt. I like the quilt better and I can continue working on the quilt border problems. After I make lunch that is what I plan to do. Peppermint – I had no idea what peppermint looked like. That is a very pretty plant. Good looking in a garden. Garden – It is growing up so well. I look forward to see the “fruits” of your labors as you go into harvest. Donna, your garden puts me to shame. I so wish that I had a nice place to put a garden. I have also been waiting for the picture of the new center of your quilt. When do you anticipate it being finished? Honahleigh, thank you. 🙂 I hope you enjoy working in your garden. They are a joy to those who love gardening and a lot of good hard work. 🙂 May the Lord bless your homeschooling. It’s like gardening – a lot of good hard work and with a great harvest. Elaine zinnias are truly lovable flowers. 😉 Earlier in the growing season, I thought mine were going to die. I had to wash their leaves every day when they were small. They had some sort of pest on them that was sapping their energy. They survived! Donna, the tender loving care you put into ‘things’ whether zinnias’s leaves or your son’s quilt is where I see Jesus in you. It is just refreshing. The new quilt center is perfect, me thinks. If you ever decide to sell a quilt, I want to be your first customer! Oh, I forgot to say I started a book for daughter #3. She is enjoying it and has not complained about it. Next step is to make one for the other girl. Wow! I am enjoying looking at all the new things you`ve done. You are such a blessing to all of us! Thanks! I am going to try using Grades and Attendance our next school year. I do have one question though, is there anyway to print out a “report card” every nine weeks? Yes, the current report card could be altered to do that.